Lacking such an expansive stage, as well as a ballet and a marching band among other necessities, Nafziger and colleagues Joan Griffing and Ryan Keebaugh are providing the next best opportunity. The works’ perennial themes of faith and doubt and the clash of tradition with modernity take center stage – albeit in an abridged version – at the university’s annual gala music concert Nov. 14, 7 p.m. in Lehman Auditorium. Music lovers who regularly attend EMU’s annual gala concert, and those coming for the first time, will be delighted at this rare opportunity to hear “Concert Selections from Leonard Bernstein’s MASS” by Doreen Rao, the only sanctioned, abridged version in the history of this major work. Vocal soloists include sophomore Sarah Sutter, juniors Sam Swartzendruber and Jon Bishop, and seniors Guilio Garner and Heather Evans. While the Bernstein piece will be the highlight, other works are also in the evening’s program. 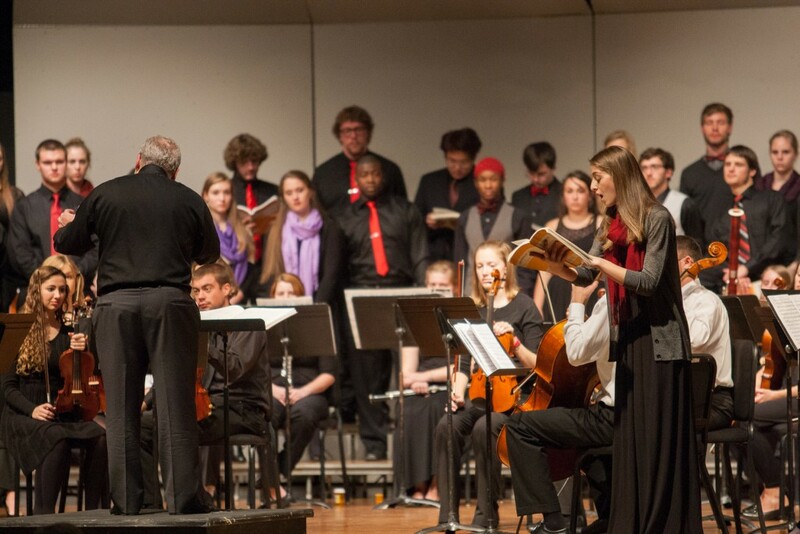 The annual concert brings together the Chamber Singers, men’s and women’s choirs, Emulate, Chamber Orchestra, and the Wind Ensemble. The concert is the primary fundraiser for the music scholarship fund. The suggested donation is $10 per person.